The £11m Trump Turnberry resort in Ayrshire has had its property tax reduced by £109,530, South Ayrshire Council has confirmed. The relief cuts the hotel's annual rates bill by 13.5%. The business rates relief scheme was launched to help revive the country's struggling tourism industry. In February, Scotland's finance secretary placed a 12.5% cap on rising business rates for 8,500 firms in the hospitality sector, which includes hotels, restaurants, cafes, pubs and other businesses. South Ayrshire Council said that the tax relief awarded for the 2017-18 financial year was mandatory and as such, had to be awarded. 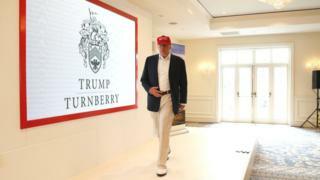 Trump Turnberry, a luxury golf course resort, is expecting record revenues of up to £18m this year and has forecast a profit after years of losses. "From the business we have on the books so far, the pace is telling me the Trump Turnberry will have its best year of revenue in 100 years," Trump Turnberry's general manager, Ralph Porciani, told the Guardian in January. The information first came to light in response to a Freedom of Information (FOI) request made by Scottish news site The Ferret, as part of a joint investigation with the Guardian. "Our hospitality rates relief is available to 8,500 businesses and 100,000 small business properties - half of all properties - pay no rates at all," said a Scottish government spokesman. "It is for businesses to apply for rates relief and for councils to ensure those which do are eligible. "The Barclay Review, published today, provides recommendations for further reforming the system including around golf courses, and ministers will respond to the report swiftly."